My feet have been bothering me lately and I'm not sure what to do about it. My wife suggested that my tendency to switch shoes, rather than sticking to one pair, may be causing the issues. She may be right. The question is which pair to use? I've struggled to find my perfect running shoe and I haven't been too successful. But is the act of trying different models undermining the process? I've tried a lot of shoes in the three-plus years since I've been running. Most were fine, some awful and a few great. But the great shoes also had their flaws. My two pair of Brooks Adrenaline's have never disappointed (I retired the GTS-9's after 700 miles, still using the GTS-10's), but they are old school in design, with a high platform and ramp angle. 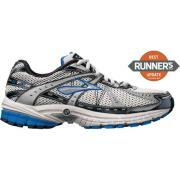 I run with the GTS-10's for recovery or if I detect a knee problem. A few runs in them seems to correct any issue. The original Kinvaras were my second great model. They felt like the perfect shoe from the first time I tried them on and maintained that feel, almost to the end. But something happened and my last few runs resulted in knee pain that coincided with last year's Half Marathon. I'm hoping the new Kinvara 3's are sufficiently improved to ward that off after I've covered a few hundred miles in them. Surprisingly, the best shoes, day in and day out, have been my Saucony Hattori's, a shoe so minimal it lacks a mid sole. But they are incredibly runnable, comfortable and responsive. The downside is that the uppers are ripping after 300 miles. I can still wear them, but time is running out. My second pair of Hattori's, that should feel and perform identically, don't fit correctly on my left foot and I've given up on them after 67 miles. It makes me wary of getting a replacement pair for my good Hattori's. Right now I'm really pleased with the Spira Stingers, but I am experiencing this foot pain. I really don't think it's coming from these shoes and I'll run with them exclusively until Sunday. If my foot problems improve, I'll credit the Spiras. If they don't, I'll do a few runs in the GTS-10's and hope for a quick recovery.